An important event in world history was the conquest of the Aztec Empire by Spanish conquistadors in 1521. As part of the conquest the Spanish conquistadors, who were led by Hernan Cortés, took the Aztec leader Moctezuma II captive. Soon after, Moctezuma II was dead and the Aztec people retaliated against the Spanish forcing them to flee the Aztec capital. The Spanish referred to this event as ‘Noche Triste’. Following the events of Noche Triste, the Spanish fled to Tlaxcala, chased away by Aztec warriors. In Tlaxcala the Spanish recovered from their wounds, including Cortés and Alvarado who were both injured in the escape from Tenochtitlan. This time in Tlaxcala had impacts for both the Spanish and the Aztec, because the Spanish were able to resupply and received new Spanish troops while the Aztec suffered from the consequences of the spread of European diseases. When European explorers arrived in the New World during the Age of Exploration they brought with them many different types of diseases that were not already present in the New World, including: smallpox, influenza, measles, malaria, chicken pox and yellow fever. 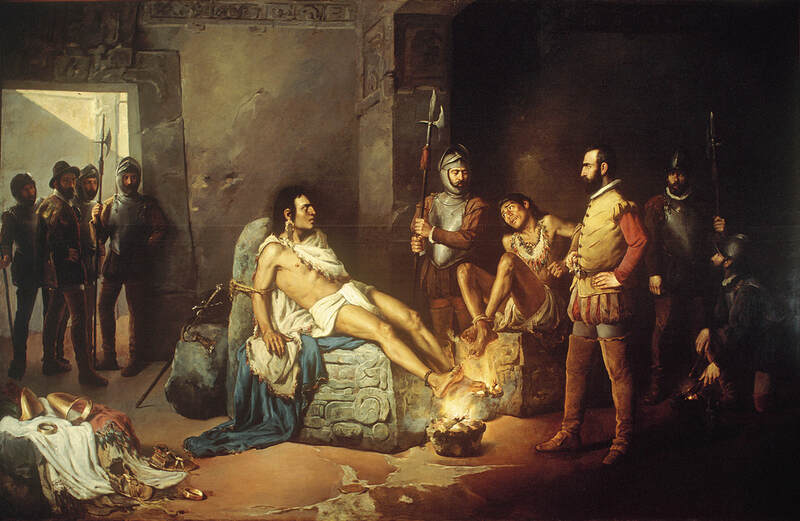 Historians are unsure of how many of the Aztec people suffered and died from the spread of disease at this time, but their newest tlatoani, Cuitláhuac, died from smallpox. This is important because the Aztecs lacked stable leadership during the Spanish conquest of Tenochtitlan, since their leaders (Moctezuma II and Cuitláhuac) died. Regardless, the spread of smallpox throughout Tenochtitlan severely weakened the Aztec people and aided the Spanish in their final battle against the city. A new tlatoani, and the final one to rule over the Aztec Empire, Cuauhtémoc, was chosen in February of 1521. 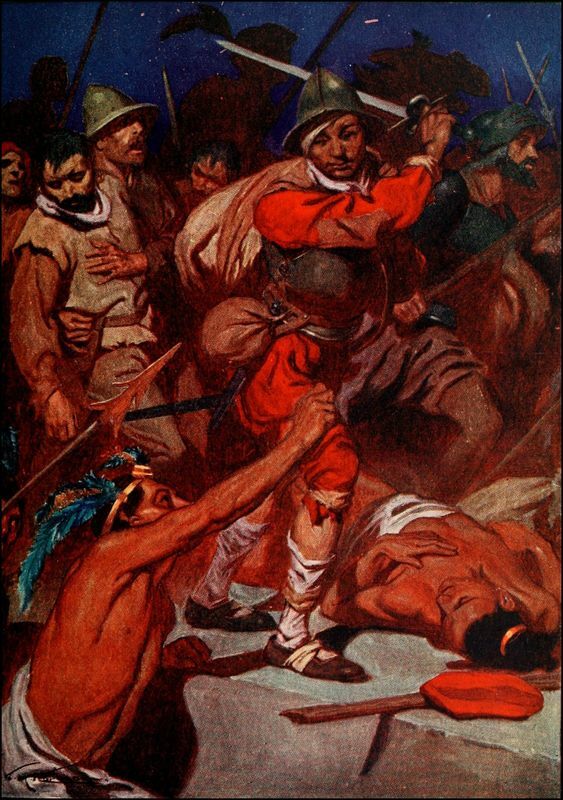 Resupplied and with new Spanish soldiers, Cortés further prepared for his attack against Tenochtitlan. The Spanish and their Tlaxcalan allies left Tlaxcala on December 26th, 1520 and immediately went to work in creating alliances with other powerful city-states in the region of Lake Texcoco against Tenochtitlan. For example, in a short period of time, Cortés was able to get several other Mesoamerican societies on his side, including former members of the Aztec Triple Alliance such as Texcoco. As a result, when Cortés attacked Tenochtitlan in the spring and summer of 1521, they were aided by thousands of Tlaxcala and Texcoco warriors. As well, at the start of the final battles for Tenochtitlan, the Spanish had nearly 1,000 soldiers of their own, over 120 horses, newly constructed ships for use on the lake, and newly arrived firearms and gunpowder. 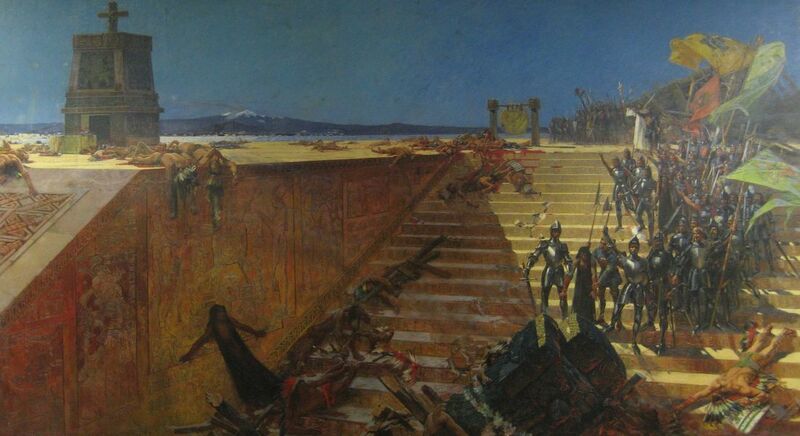 The Spanish began their attack against Tenochtitlan by destroying the aqueducts that brought fresh water to the city. 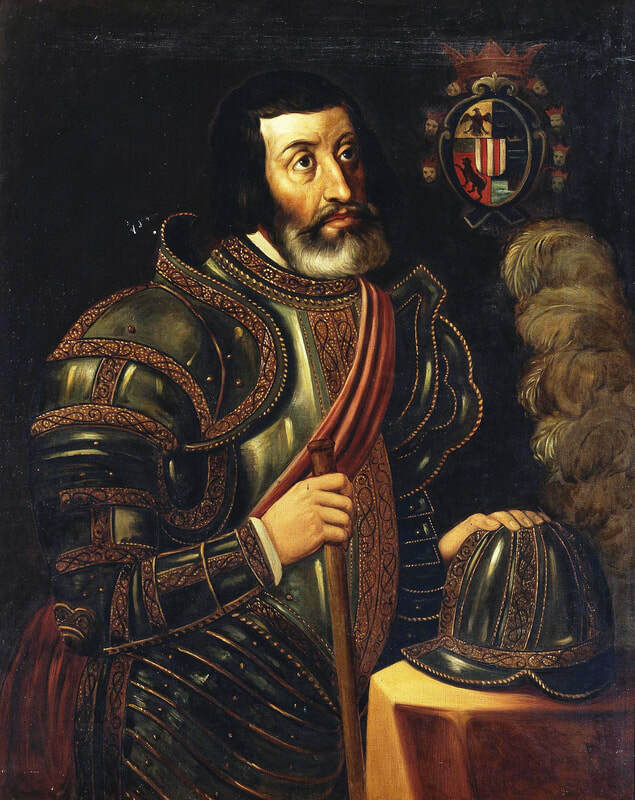 As well, Cortés ordered his troops to surround the city and stop it from receiving food supplies. This effectively cut off the city from the surrounding areas and further weakened the already suffering Aztec people who were struggling with the effects of smallpox and unstable leadership. Furthermore, Cortés had his men launch several small ships into Lake Texcoco, which prevented the people of Tenochtitlan from escaping or receiving help. The fighting of the final battle for Tenochtitlan was brutal. The Aztec people in the city, who were starving and suffering from smallpox, were bombarded by Spanish cannons and firearms. While the Aztec carried out several counterattacks they were mostly ineffective due to the Spanish’s organization, alliances and overwhelming military power. Apparently, Cortés had hoped that the Aztecs would surrender so that he could capture Tenochtitlan intact and present it as a prize to the Spanish monarch Charles V. However, during the battle, the Aztec’s sacrificed many of the Spanish prisoners of war that they had held captive. This angered Cortés and caused him to order the destruction of the city and the Aztec people. 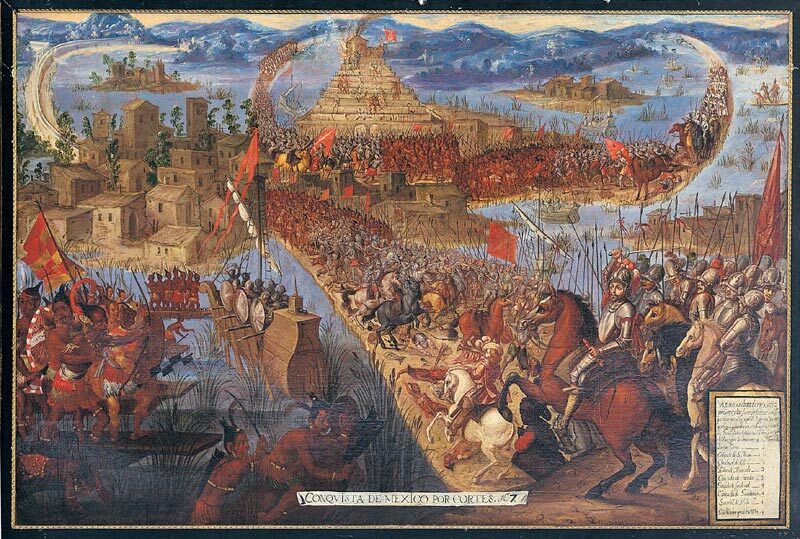 Tenochtitlan was finally captured by the Spanish and Tlaxcala on August 13th, 1521. Cuauhtémoc was taken prisoner and the Aztec Empire was no more. The battle had devastated large parts of the city, with huge sections of the temples and buildings destroyed. However, after capturing the city, the Spanish continued its destruction by taking down any religious symbols and temples. As well, they burned large areas of the city to root out the remaining people. With their city destroyed, the Aztec people scattered throughout the Valley of Mexico. Cortés and the Spanish began to build a new city on top of the ruins of Tenochtitlan, which eventually became Mexico City. 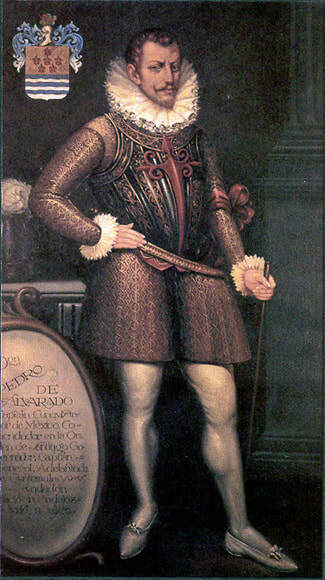 For his part Cortés later became the governor of New Spain and gained wealth and infamy.